Have you ever been on a cell phone where there’s a poor connection and you’re only getting fragments of what the other person is saying? Then it’s like a puzzle with you trying to string together and make sense of the few words that you could understand while at the same time trying to listen to the bits and pieces that are forthcoming? This is what my world is like on a daily basis because I am hard of hearing. My hearing loss falls into the “severe” category (a loss of about 70%, slightly different for each ear) and is a special kind of sensorineural* hearing loss often referred to as “cookie bite” hearing loss. 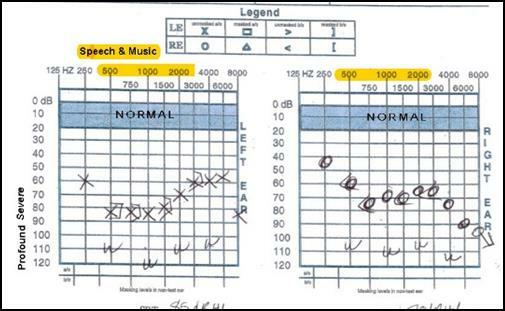 My audiogram shows some hearing at the low and high frequencies and almost none in the middle. The ‘bite’ that is missing are the middle frequency sounds. Mid-frequency sounds are where you can intelligently determine human speech (and music). My loss in the mid-frequencies is 70-80 decibels (normal hearing is 10-15 dB). 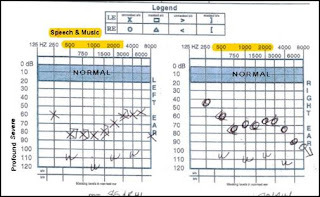 Above 90 dB is considered “profound” hearing loss where the use of hearing aids is no longer effective and cochlear implants can be considered. Low tones are also a problem, so I typically can hear/comprehend female voices better than male voices. Sound has a tinny quality, which is something my audiologist works to correct. But at the end of a long day, most sound comes across as unintelligible noise and often I can’t wait to take out my hearing aids. But the benefit is that I sleep through everything. Noisy hotel rooms, not a problem! A cookie bite hearing loss is very often hereditary, and is probably the case for me because my paternal grandmother was completely deaf by the time she was in her mid 60’s. Often, such as in my case, a person experiences some hearing problems as a child but it worsens slowly but significantly later in life. For years I had a manager whose husband is hard of hearing and so she spoke loudly as a matter of course. This worked to my advantage but at the same time, it insulated me from my hearing loss. According to www.hear.com, this type of hearing loss can lead to social problems when individuals struggle with holding a conversation. Music is harder to listen to. Warning messages can be missed in public places, and sirens and alarms can be more distressing to the ear when you have cookie bite hearing loss. This hearing loss can go from being frustrating to severely limiting to a person. For example, when I travel, it’s hard to hear flight attendants or when they announce gate changes or boarding groups. About 8 years ago I finally acknowledged that my hearing was in serious decline. I received my first set of hearing aids and have had several upgrades since, including special in-ear molds to channel sound more effectively. It’s a scary and stressful thing to lose your hearing, one of your key senses in interacting with the world. It affects every aspect of your life: mental, physical and emotional. It affects all your relationships. But thankfully, technology keeps improving. Last Saturday afternoon I took a walk to City Park. It was cold, but the sun was shining, and I was marveling that there was so much bird song in the air on this February day. I stopped walking and closed my eyes. I could hear the wind in the tops of the cottonwood trees, rattling the hundreds of dried leaves that held on through the fall. It wasn’t just the generic wind-in-the-trees sound that I heard. I could hear the sound the individual leaves made in the wind, plus the birds singing. A car drove by on the street behind me. I heard it, plus the wind in the trees, plus the leaves, plus the birds. There were kids playing on the other side of the park. I could hear them laughing and shouting. I thought, the world is so rich, and I am back in it. Flash back to a couple of weeks ago when my audiologist recommended a new class of hearing aid that is specifically engineered to clarify speech. She offered me a free one-month trial. I was hesitant at first because if I decided to purchase them, they would cost $6,890. Hearing aids are not covered by health insurance. My audiologist said that she thought that I would be less tired at the end of the day by having improved hearing, especially with the boost in speech clarity. Being deaf isn’t just a problem of volume but of comprehension and clarity. Talking to people is exhausting as I hang on every word, trying to figure out if someone said “coat”, “boat”, or “float.” My son is great about providing context. For example, if he says the word “float” and I don’t understand, he will say, “You know Mom, like a root beer float.” Depending on who I am talking to, sometimes I only understand a few words per sentence and am continually trying to play catch up. Because of the energy it takes, I avoid unnecessary conservations with friends and strangers alike. I find that in group conversations, I’m quiet but one-on-one I am more outgoing. And using the phone with voice is one of my biggest challenges. I have a captioned phone, but the live transcribers only correctly interpret about 60% of what is being said, and that’s for “social” calls. For work calls the percentage is lower because the subject matter is technical. A huge thank you to the transcribers. It must be challenging work. For instance, take a recent phone conversation that I had with a girlfriend who asked, “If I say $#@!, will the transcriber type $#@! ?” Ha-ha, yes, they type whatever they hear! Work meetings and social situations are the most taxing. Even with decent hearing you only have so much energy to listen, process, integrate and respond. Most of my energy budget goes towards listening and comprehending and at the end of a meeting I am exhausted and want to crawl under the table. Nowadays there is a myriad of ways of being trapped on a bad ‘sound stage.’ I work for a global organization and routinely interact with colleagues who are on headsets, cell phones, speaker phones, and group internet meetings. There are a number of webinars where I’ve called in, only to hang up due to the inability to hear. Even though my organization is supportive and accommodating, there are no captioning services for the many webinars and trainings that we have. Social situations are a different problem because in work meetings, people make an effort to speak clearly and professional meetings are usually held in an adequate hearing environment (compared to a noisy restaurant). In social situations, for example, I never get a joke because they are said as an aside. At the beginning of a new situation, I will usually start by telling people that I am hard of hearing. But most of the time people laugh and say, “oh yeah, me too.” Lately I’ve switched to “I am deaf” because it’s more to the point and is taken more seriously. What I need is not for people to simply speak louder but also to speak slowly and clearly. I am not always up front and clear about what I need, because sometimes the situation doesn’t warrant it (the grocery store conversations) or I just plain don’t care – being an introvert as well as being tired of the hearing battle! And sometimes I just want to feel normal and fit in. I don’t think that most people really understand how hard it is to hear words and what is being said. For social situations I go through 3 stages. I start out engaged (if I’ve had time to recharge after work), then quickly get tired, then give up. You can only nod and smile (and pretend to have fun even though you can’t hear a thing) for so long before you want to run screaming for the door. The killer is that if I don’t muster the energy to nod and smile, then I appear disengaged, aloof and humorless. For people who know me, they understand what is happening but in new situations it’s tough. It’s also a learning curve meeting new people and understanding how they pronounce their words and getting used to their particular voice. I live in a small town and you can’t go anywhere without seeing someone you know. I can only guess how many times people have said hello to me when my back is turned and it seems like I’m ignoring them. This happened recently, and I only clued in when I randomly turned in their direction and caught the person walking away and rolling their eyes as in “what a clueless ditz.” I tend to annoy people with my deafness – such as when I mishear a waitress and respond with the wrong answer. Waitress: “What would you like to drink?” Me: “Blue cheese dressing.” I don’t get anything that is said in a restaurant and rely on my family and friends to interpret. Most of the time it doesn’t bother me that I’m inadvertently annoying other people, but some days it gets me down. Then there’s the most significant and disheartening part. The less you hear and comprehend, the less you try to be in the world. A few years ago, for the most part, I gave up on phone conversations with friends and family. Thankfully, there is email and chat, but I really missed the sound of my loved one’s voices. Whenever I called my best friend, who lives in another state, I would end up asking her to repeat everything 3 or 4 times. And often after the 4th try, I still didn’t get what she was saying. After hanging up the phone, instead of being buoyed up after a good talk with my BFF, I would break down in tears. Or throw the f’in phone across the room. There’s also the problem of communication with my two wonderful, and mostly patient, teenage children. There have been countless misunderstandings, disagreements and even all-out fights because of my hearing loss. Things that they think I forgot which I never heard in the first place. There are the dinner table conversations where everyone is sharing their day and laughing about something that only makes sense after I ask so many times that everyone ends up slightly annoyed with me. Then the moment is gone. I can’t hear either of their voices without my hearing aids, making nighttime and mornings challenging. With them in I can hear my daughter better than my son so when we are out and about she is kind enough to act as my interpreter. But the upside is that in order to communicate, we have to stop what we are doing so that we are face to face and really connect, a rarity in our busy world. Recently my children took a sign language class with me. The instructor is Deaf, since birth, and she was funny and engaging and we learned a lot. Since I have some hearing it’s hard for us to commit to practicing. But having a few signs in our back pocket has cut down on miscommunication. The class was a reminder of what a strange space I inhabit. I’m not part of the Deaf community, and will never be fluent in sign language but rather I am expected to be part of the hearing world, slugging it out day by day which isn’t 100% workable either. Prior to getting my new aids I wanted to take them out forever and be done with the struggle. I figured if anyone wanted to communicate with me, they could write a note (which is how we talked to my grandma). So… back to my recent experience at the park. My new aids aren’t perfect, but they have helped enormously at a time when I felt like giving up. First and foremost, they have brought my loved ones’ voices back to me. I called my Dad on Saturday and after the call I shed a few tears. Not tears of frustration but tears of gratitude. I thought, “oh, that’s what my Dad’s voice sounds like…. I remember!” We have special challenges between the two of us. He lives in another state and has Parkinson’s, which has made his voice faint if he’s tired it’s difficult for him to enunciate. It’s hard for him to type so we don’t connect as often as we should. The new hearing aids, besides the improved voice clarity, pipes phone calls directly to my aids. There is no substandard phone connection, headset, or other intermediary device to distort the sound. I didn’t track everything that he said but the frustration level on both ends was much less and we enjoyed the conversation. The other milestone is that I participated in a staff meeting via phone and I could hear everyone on the call, differentiate who was speaking, and comprehend almost everything. Instead of being on the edge of my seat, I was relaxed and listening. It was wonderful and I felt like part of the team. In the afternoon I had another call, which normally would make me nauseous just thinking about two calls in one day, but it went just as well as the first. And my audiologist was right, I didn’t feel as tired at the end of the day. It’s estimated that people with hearing loss spend 40% of their daily energy on trying to hear! I ran into a friend while out cross-country skiing and struck up a conversation, something I would normally avoid because I can’t hear her soft voice. It was fun to catch up on our kids and life in general. I went to a going away party for a co-worker in a loud bar and didn’t hate it. 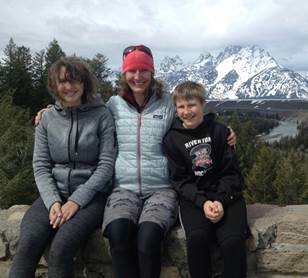 I went on an epic outdoor adventure with friends in less than ideal conditions, but I was able to wear my hearing aids when normally I would have had to leave them out. 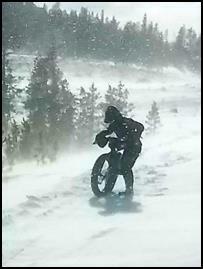 We biked 30 miles over snow in gale force winds for an entire day, but the new aids didn’t cause “wind feedback” so it didn’t make me crazy like it usually does. They are comfortable enough to wear with sunglasses and a helmet, which the old ones were not. It’s a safety concern – I need to hear snowmobiles coming up behind me. I enjoyed the company of my friends and even listened to music via Bluetooth connected to my iPhone. It made what could have been a mentally challenging day not so much. In the last few years, without even realizing it, I voluntarily and involuntarily retreated from the world. To save myself and others from frustration. To avoid feeling left out and dumb. To avoid being viewed as humorless and aloof. Reflecting back, I can see that it was especially challenging because it was a time when I could have used the support of others as I went through some major life changes. It wasn’t only the “big” things that I was not fully engaged in – family conversations, social situations, and work. It’s also the small interactions that I’ve missed, such as small talk with the nice teenager that makes my Subway sandwich. These tidbits of social life contribute to mental health in larger ways than I’d expect and are not to be taken lightly. Imagine that every sound that you hear comes to you by way of a radio station that you can’t quite tune in. And everyone sounds like Charlie Brown’s teacher, but she’s on a cell phone with a poor connection. Most days were like that. Thankfully, now I have a clearer connection. To my family and friends. To the birds in the park and the wind in the trees. And the practical stuff: I can hear water boiling on the stove so that I remember to throw in the spaghetti. I can hear the doorbell ring or the dog barking. I can hear my kids laughing, even in the next room. It’s not perfect but it’s better. Someday I may be completely deaf like my dear sweet Polish grandmother but for today, I am grateful for every little thing that I can hear. I came into 2019 with a goal of taking charge of the aspects of my life where I can make a difference and ended up with improved hearing, a better attitude, and a more hopeful outlook. This last tidbit is a funny story – a week ago while I was grocery shopping an elderly gentleman grabbed my buns. That is to say, he was passing in the opposite direction with his cart and grabbed the dinner rolls out of my cart. We laughed as he explained that in the big cities, it’s a “thing” where teenagers steal random items out of other peoples’ carts. Before my new hearing aids, I would have never been able to hear/understand a word that he said and would get frustrated. But we had a fun, brief connection that left me smiling. Something that I might have missed, although I still would have had to get my buns back. * Sensorineural hearing loss means that you have damage to the hair cells in your inner ear or to the nerve pathways that lead from the inner ear to the brain. While much of sensorineural hearing loss is age-related, there are other factors that may cause it, too. Many people with sensorineural hearing loss report that they can hear, but they cannot understand speech. This is especially true in the presence of background noise. There are two types of sensorineural hearing loss: congenital and acquired sensorineural hearing loss. (healthyhearing.com) Mine is likely a combination of the two. What hearing aids do: Hearing aids don’t correct hearing in the same way that glasses correct vision. Hearing aids boost volume and the better ones try to approximate what noise sounds like with normal hearing. But everyone’s hearing loss is different, including differences between the right and left ear. That is why working closely with your audiologist is important so that she/he can adjust the volume to a comfortable level, tinker with the settings for clarity and try to minimize the areas that are grating. Be patient, it will likely take repeated visits to get it ‘right.’ If you or a loved one suspects that you have hearing loss, please get your hearing tested. Sooner is better than later because the longer you delay the harder it is with regards to comprehension.